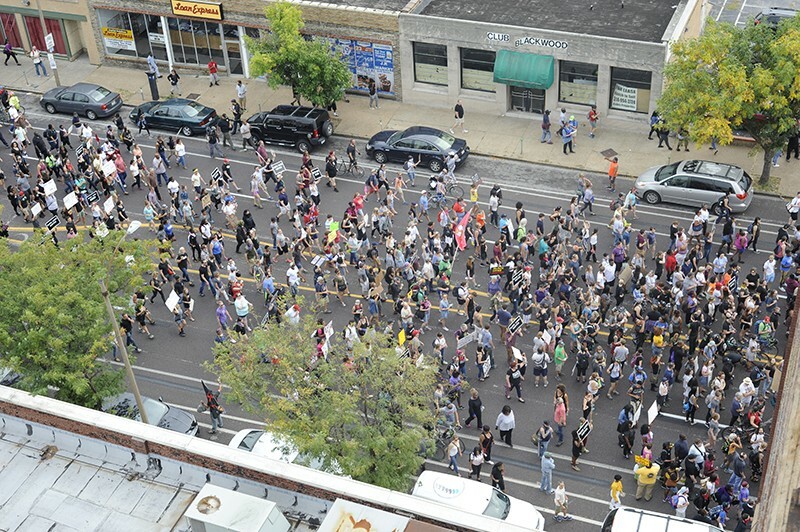 Hundreds of people massed outside the St. Louis Metropolitan Police headquarters on the afternoon of Sunday, September 17. Hundreds, if not 1,000 or more, protesters demonstrated peacefully outside the St. Louis police headquarters this afternoon for roughly two hours before going on the march. The protesters filled the streets, chanting and leading a die-in, while police officers watched from a distance. 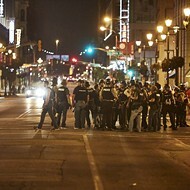 Olive was shut down from 18th to 20th streets during the hours of demonstration. The action was entirely without incident for its two hours in front of the police building, which is located at Olive and 20th Street. 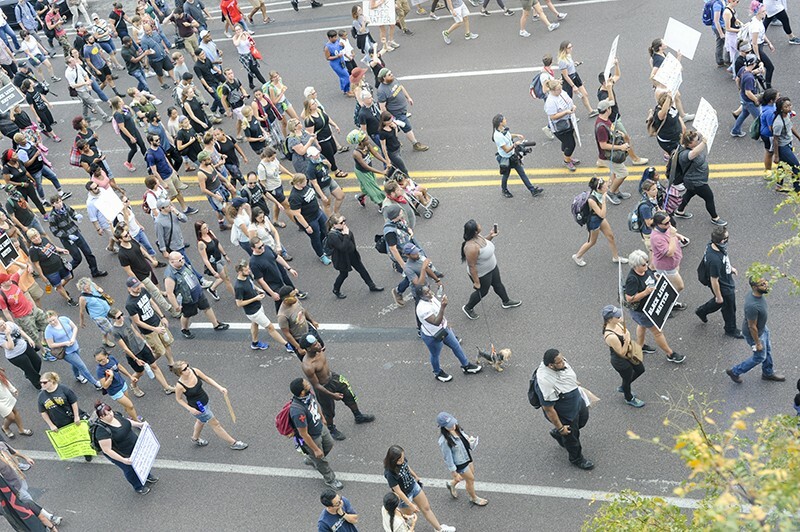 At one point, protesters were still for six minutes of silence — noting that it's been six years since Anthony Lamar Smith was killed by then-St. Louis police officer Jason Stockley. 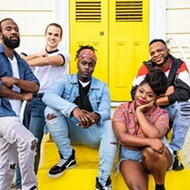 Stockley's acquittal Friday has kicked off days of protests (see here, and here). At any rate, the gunman were polite to the photographer who joined them. The RFT's Doyle Murphy shot the video below as the protesters headed from downtown towards Midtown, taking a few quick maneuvers seemingly designed to outwit (or at least get ahead of) police officers as those assembled marched to Chaiffetz Arena. Then they marched through the campus of Saint Louis University. 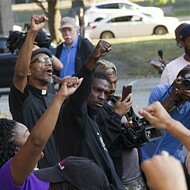 Stopped by a police line at Grand and Forest Park, protesters changed course. They remain on the march. 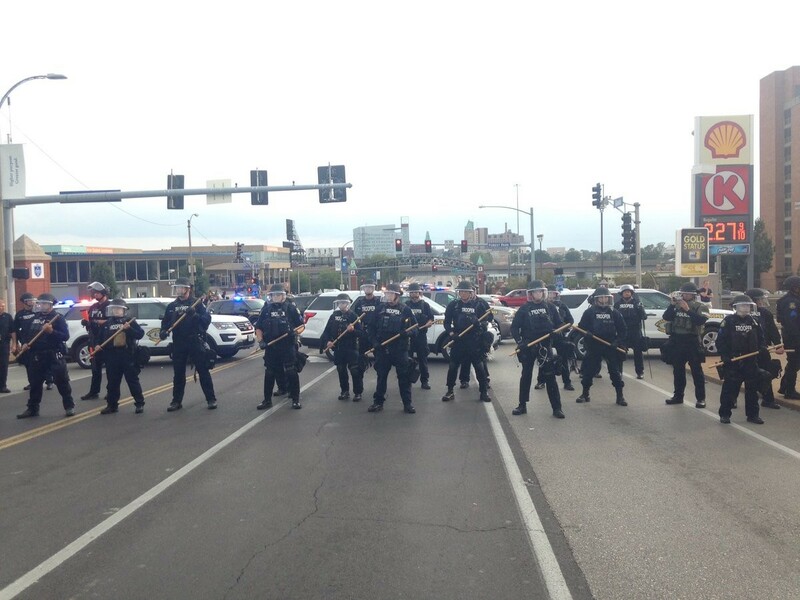 Police seem willing to let them have the streets, but are not letting them get on the highway. On the SLU campus, the protesters reportedly got a warm welcome from a few local Jesuits. 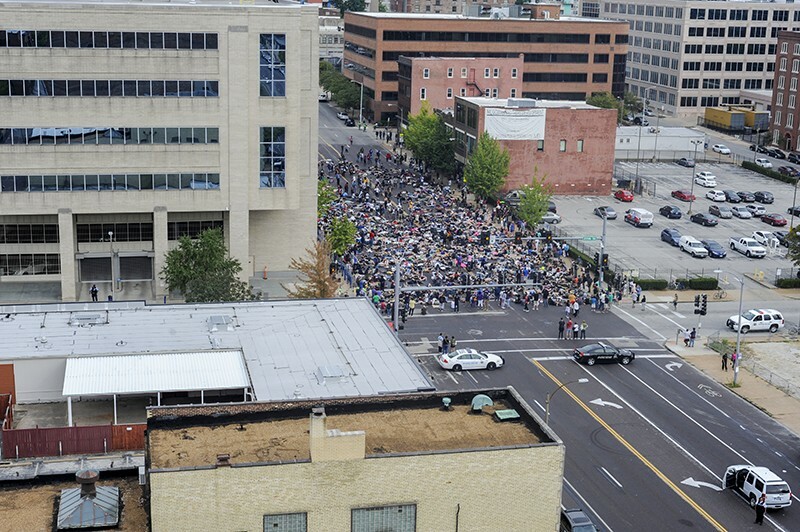 After their journey through SLU, the protesters then circled back to downtown, as shown in this video by the RFT's Danny Wicentowski, shot at the roof of the RFT's building at 21st Street and Locust. The protest largely finished by 8 p.m. The crowd began to disperse, without hundreds going home. Only a hundred or so people continued to march, heading east further into downtown. It was at that point that some agitators broke windows on Olive. 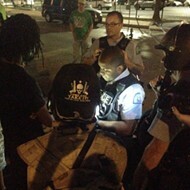 At 8:50 p.m., police gave official orders to disperse. "This is no longer a peaceful protest," they tweeted. Police say they have made multiple arrests, and warn that commuters downtown may face "delays and temporary street closures."